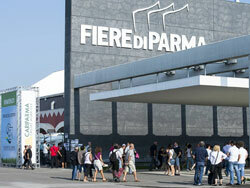 Our participation in CibusTec, at the Parma Exhibition Centre, as the Storci-Bs business network was a huge success. Visitors from all over the world showed a great deal of interest in the latest innovations presented by our business network, requesting a lot of information and quotes for our lasagna and cannelloni ready meal lines and the multiproduct line. What is more, there was a general interest also in our dry, fresh, gluten-free and instant pasta lines. Giuliana Gerini, from Storci’s sales department, said: “There were really a lot of people around our stand and we are happy with how CibusTec was organized and the large number of contacts we made. It was an opportunity to meet up with old and new Storci customers and create that one thing we all have in common: a passion for pasta. A really positive result".